Jason Harris-Cohen, founder of professional house buying company Open Property Group, talks about whether micro-homes can help developers meet the needs of first-time buyers? Last year, the chancellor announced that 95% of first-time buyers (FTBs) would see a stamp duty cut, while 80% would pay none at all, as a result of changes to the tax. This came as a surprise to me, as I’m sure it did many other property experts, but I was pleased to see some steps being taken to help those trying to get on the first rung of the ladder. The chancellor also said that ‘over the course of this Parliament, a million first-time buyers will save on average around £1,700’, though the Office for Budget Responsibility claimed that for some people the savings would be more than offset by increased house prices. Fast forward to January 2018, a few months after the dust had settled. The Government claimed that more than 16,000 FTBs had already saved money as a result of the reforms – yet, in this Telegraph article, nine out of ten housing surveyors said they had not seen a rise in interest from this demographic. The changes were expected to help those looking to become a homeowner in London the most, where the average cost of a house is £472,000, as recorded by the Office for National Statistics (for February 2018). Despite the city experiencing its lowest annual growth since September 2009, the fact remains that house prices are just too high compared to wages for most young people. We’re continuing to see FTBs – and renters alike – widening their search to include more affordable commuter towns. But, what’s really interesting is the growing number of people who are so determined to turn their house buying dreams into a reality that they are willing to make sacrifices in order to work and live in the capital. For some, the sacrifice is disposable income, but for others it’s living space, with FTBs snapping up micro-homes and other alternative living arrangements. Micro-homes are commonplace in Japan and have been growing in popularity in the UK since 2013, when the Government changed the rules to allow developers to convert offices into residential homes without planning permission. In 2016, a record 8,000 micro-homes were built. They often hit the headlines for being roughly the same size as a London Tube carriage, which some experts and campaigners criticise for being less than the national minimum guideline of 37 sqm. Micro-homes have also been criticised for being part of the housing crisis problem, as opposed to a solution. Regardless of how you look at it, the fact is they’re being snapped up fast. And not just in London either, Liverpool, Leicester, Birmingham and Bristol have been named as the micro-home hotspots in the UK. Property professionals are getting in on the action too; with one purchasing a 27 sqm Chelsea property for £713,823 – more than £100,000 over its asking price. Once refurbished, experts reckon the home could be worth up to £1 million. It’s not just micro-homes that are growing in popularity, savvy renters and buyers are gravitating towards cheaper living arrangements, such as converted caravans, houseboats and small, self-built houses. A year ago, there were almost 4,000 boats registered to be moored on London waterways, according to the Canal & River Trust. The rise in caravan and houseboat living also lends itself to the nomadic lifestyle trend, where an individual constantly changes locations. It’s no secret that there is more demand than there is supply for housing in the UK right now. As for the houses that are being built? The statistics show that they are getting smaller and smaller, especially when compared the average size of a newly built home in other European countries. What’s more, although there is a national minimum guideline of 37 sqm, it’s not legally binding; there are micro-homes that are less than half the size of this. Building higher volumes of smaller homes is something that construction firms have been doing in order to maximise output. But they’re also taking note of the trends, and many have recognised that there is a demand – and even a desire – for smaller houses, especially among young professionals. One property development company hit the headlines towards the end of last year when it announced plans to introduce a ‘compact living’ scheme, comprising 19 and 24 sqm mini flats. Other firms have decided to specialise in this niche but growing area. 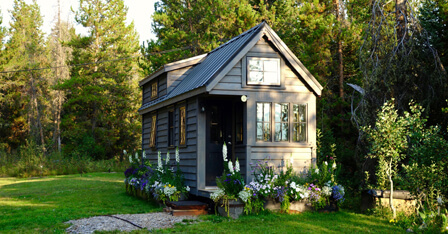 I believe we have yet to see the full extent of the micro-home trend. In addition, it looks as though modular apartments/homes may be coming back into fashion. They used to be poorly built and unappealing to the eye, but they’ve come a long way since then and are generally more eco-friendly. If construction companies decide to delve into the world of micro-homes and alternative living arrangements, then there’s one important thing they need to bear in mind – renters/buyers may be willing to sacrifice living space, and they may even enjoy living a minimalist lifestyle, but they do expect a cleverly designed home in exchange, that has made the most of every inch of space it has.